Among the many things Harold, Slimdog, and I visited about last Saturday in Kearney was how to help the people who might benefit from the Beginner's Corner become aware of its existence. NEFGA has a nice supply of business cards with our website address that could be handed out at events such as the Family Fishing Nights coming up Aug. 26 at Halleck Park in Papillion and Aug. 27 at Holmes Lake in Lincoln, the Missouri River Outdoor Expo Sept. 20-21 at Ponca, and NGPC's Becoming an Outdoors Woman program Oct. 3-5 at Halsey. I plan to attend the Papillion night as a volunteer and can pass out some cards there. How about these other events? Anyone going who would be willing to distribute some business cards for NEFGA? We'd also welcome your ideas about other opportunities to spread the word. Great ideas, OBG! I have those cards if anyone needs some. I'm happy to say we are finally putting a big dent in our supply of those cards. I have an idea, probably more for next year, OBG, but I think it might be a winner!! I try to give some to every sporting goods manager I run into anywhere, like when I'm in the store or baitshop and just ask them to put them on the counter or bulletin board. They usually will ! Well, even getting people to the board might not do the trick, it's kinda tucked away. Move it closer to the more used fishing forum, maybe make it and this forum subforums of that one? Include the articles in posts in the forum, just a simple title and link would be good. To me initially the forum seemed empty, the links up top are not terribly obvious. Coop, are you referring to the Beginner's Corner main article or to all the other articles over on the website homepage? I certainly agree about the need for a more visible link to the other articles from the Forum homepage, and I'm told J.T. has been working on a solution. Scheel's in Lincoln would probably let you post cards there. Hmmmmmm. I know of someone who was recently on the "South Central Nebraska Tour" that "visited" Elwood Reservoir during the lunch hour... rumor has it that (he) placed an NEFGA business card on the drivers side window of all the vehicles with trailers in the parking lot. Someone had put a bumper sticker on a "faded out" sign at the exit of the boat ramp. It now has with it an NEFGA sticker, proudly centered on the sign. We can best promote the NEFGA by "circulating" the information at our favorite fishing locations, as well as those we are just "visiting"! Note to Catfish Steve: On the next batch of cards, I would suggest adding the "Beginners Corner" to the information. New since the last printing, In My Opinion, this program and the line bins are what separate the NEFGA from all the other fishing forums! Yea, I agree, we need to move the Beginner's forum front and center on our cards!! I have a Recycling bin program vinyl lettering thing on my vehicle, how about we do a Beginner's corner thing and put those out as some vinyl lettering or maybe even do a handbill featuring the Beginner's Corner that we distrubute to all the G&P offices that the can include for distribution with all the other stuff they have at those offices? I like that idea! If you will get with OBG and produce a "handbill", I will be more than happy to have them printed. I also think that a printable copy should be posted where appropriate so that individuals may "print a copy". When you guys come up with the handbill, e-mail it to me and let me know how many you need. Expect about two weeks from then to have them done. Microsoft Word would be an excellent program to use, I also recommend Microsoft Publisher for a 3-fold handbill. BTW, there will be a "news report" in the Kearney Hub concerning the Catch & Continue Ceremony at Cabela's and includes the NEFGA "get-together". I will send you a copy after it appears in the HUB! The forum looks 'empty' at first glance to me, and I'm fairly tech savvy. I'm guessing it does to people unfamiliar with the site as well. I also think the forum itself is a bit buried. Being at the bottom of the fishing section puts it 'below the fold' so-to-speak, moving it inside the Nebraska Fishing Forum might not work because sub-forums can easily get overlooked as well. Moving it below the NE Fishing Forum (NFF) would give it a more prominent location. The other forums in the fishing section don't have a lot of posts, so I wouldn't be surprised if a lot of readers don't scroll a whole lot. You would expect a new user to explore a little more, but being that the 'Ask Us' forum is also in here, I would think more eyes, especially veteran eyes would be beneficial. I would make the following assumptions based on my experience with message boards, first that 75+% of the regular users go directly to the forums most of the time, bypassing the home page. So while it might seem logical to link it there as well, I'd guess that the forum home page has a much higher hit count, and increasing visibility there would be more important. Second, that these users usually quickly go directly to the NFF without much consideration of other ones. Some will quickly scroll down to the Buy and Sell section or the Hunting forum, but for the most part they bypass the stuff in the middle. After a while it becomes habit. As a final note, and I don't offer a solution here, just am making an observation, beginner's corner might be a bit exclusive of people who are in need of the information. I'm not saying it's derogatory or anything, but if someone doesn't identify themselves as a beginner, they may ignore the forum, or refrain from asking in it for fear of being labeled as one. Even if true 'beginners' are the spirit of the section, they can certainly benefit from someone who's fished bass for 20 years looking for information on how to target walleyes or catfish. Since you have single-handedly encouraged several forum members, including myself, to attend a Youth Fishing Instructor workshop, maybe a NEFGA Youth Fishing Day would be in order. One thing that I expected when the beginner's section was talked about at first, was that it would be an easy thing for beginners to find and use. Heck, it took me a couple of days to figure out where the beginner's articles actually were once they were up. I don't feel that this was accomplished. I would expect that when I hit the main forum (either from some other link or the link from the rest of the website) that right near the top (maybe even above the current fishing forum [say it isn't so]) one would see the beginner's corner forum. Once this area was opened, I would expect to see the list of topics for beginners. Maybe this is not possible with the forum software, if not then there should be a big heading to click on that says "START HERE" or some other such thing to draw attention. below that there should be the areas for ASK US and so forth. Once someone gets to the page in the fist image above and clicks a link, the rest is an excellent source of information that does the site and those involved proud, it is just that the whole thing is buried so deeply in the forum, it is hard to get to. . . .
that can be placed on stop signs around town? Okay, so that may not be the greatest idea, but that one about pamphlets that can be handed out is a GREAT idea! I would suggest that once we get it laid out (using whatever software, and preferably NOT one of the mentioned Micro$oft ones) that it be printed or saved as a high resolution PDF file that can be reprinted whenever by whoever. I have access to some nice printers, both color and B&W that I could keep myself in stock, and I bet other's do too. The file would need to be in a ready to print format. How big are we talking here a tri-fold 2-sided on standard paper (three columns on each side) type of deal? If someone can get me the text and images, I can borrow the wife's copy of Quark and get it ready for a printer in a day or two. Thanks, Don. 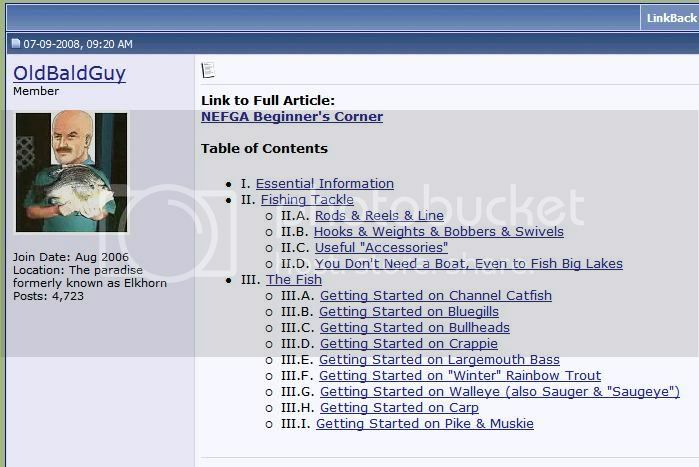 I don't know beans about website design or formatting -- my task was to put the information together -- but I suppose I was responsible for suggesting that the Beginner's Corner be a "subforum" under "Fishing," and I still think that makes some sense. I've been told that the bit-heads responsible for this place (that would be our friends J.T. and Mako :D ) have been working on a significant format change that would, among other things, make the articles on the web homepage more visible to Forum users and easier to access. Hopefully, that also would be true for the Beginner's Corner narratives. As for re-printing hard copies of the Beginner's Corner, I have two reservations at this time. First, I'd like to see us develop the sections on wipers, smallies, etc., that now are "under development." Second, I would hope to see a wider variety of "member suggestions" under each species. The advantage of an online resource, it seems to me, is the ability to upgrade it whenever the opportunity arises. I want to take some more time to think about your other ideas, but please know I appreciate your thoughts and concerns. Last edited by OldBaldGuy; 09-02-2008, 02:41 PM. I have a stack of the cards and will have them with me at the aforementioned BOW weekend in Halsey in October. I'll do what I can to get them into the hands of anyone who seems even vaguely interested. I gave out a few at the Women in the Outdoors event on August 9th, too. "Survival depends on being able to suppress anxiety and replace it with calm, clear, quick and correct reasoning..."